I like the Christmas tree to still be there in the livingroom, to see the lights while sitting and watching tv until Fabruary. I planned taking down it last Sunday, since no work and February was at the corner. After I placed some tree branches in the basket, spread the ornaments all over the braches, added some butterfly figures and also heart figures since Valentine's Day is coming.. The lights give the tree a soft, red glow. Perfect! Taking down the decorations is never as much fun as putting it up! Isn't it??? Something is missing! Hmmmm..Sweet Teddy Bears with Valentines around the basket! Have a lovely February to all! An Amazing Healing Food; Garlic! It has also been used as a medicine throughout ancient and modern history to prevent and treat a wide range of conditions and diseases like treat hypertension,bronchitis, liver disorders, tuberculosis, dysentery, flatulence, colic, rheumatism, intestinal worms,, diabetes, and fevers. I use garlic a lot for cooking..also since I have high blood pressure, I swallow sometimes a clove..Searching never ends and I love discovering new things and replacing to old knowledge by new knowledge especially for cooking to get more benefits of food God gives us. -Many of garlic's health benefits (including its anti-cancer properties) are preserved if the whole cloves are crushed and allowed to sit for 10 minutes prior to cooking. 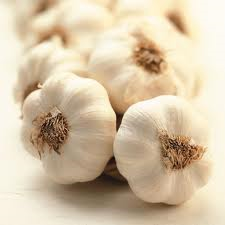 -Use garlic raw chopped or pressed in your dishes to take advantage of the benefits. In the absence of chopping or crushing, research has shown that just 60 seconds of immediate microwaving will cause garlic to lose some of its cancer-protective properties. What if you cannot tolerate raw garlic?? You can add chopped garlic to foods while they are cooking and the best to add it towards the end of the cooking process for the maximum amount of flavor and nutrition. Microwaving or boiling garlic in uncrushed, whole clove form will deactivate its enzymes, research has shown. To freeze peeled garlic; It reduces its flavor profile and changes its texture. If you would like to combine garlic with oil, just avoid high-temperature heating of this oil-garlic mixture. And garlic!! Against Stress and toxins for a Better Mood!! It also protects your heart and liver from the damaging effects of alcohol. First days of a pretty new year! Hope you all had a wonderful time New Year's Eve. I was away from mom for years and this year I enjoyed being together with her, just like last year. I think we ate too much that night :) A couple of sodas helped to feel better next day. Best wishes to y'all for 2014! It has been a while since I made it. This recipe is for eggplant lovers!. Easy and tasty! A quick and easy eggplant recipe! I like taking food pictures as much as cooking! Sometimes eggplant is bitter and should be soaked in salted water before cooking. Let drain about 30 minutes. Cut eggplants into slices as you want. Put olive oil, chopped onion into a deep saucepan and stir 2-3 minutes. Add chopped garlic and keep stiring 1-2 minutes more. Put eggplant slices and a few minutes later add crushed tomatoes. Cook stiring 3-4 minutes and add hot water, salt, pepper. Cover the lid, keep it on low heat till eggplant is very tender. Sprinkle with lemon juice. Serve warm and enjoy taste of eggplant ! There are so many beauties in life!